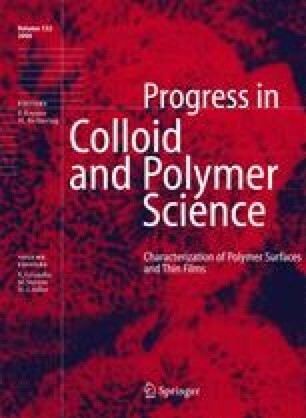 In this paper we report on AFM force spectroscopy measurements on hollow polymeric spheres of colloidal dimensions made from polyelectrolyte multilayers of polyallylamine and polystyrenesulfonate in water. We find that the shells show a linear force-deformation characteristic for deformations of the order of the shell wall thickness. This experimental outcome is discussed in terms of analytical results of continuum mechanics, in particular the scaling behaviour of the shell spring constant with wall thickness, shell radius and speed of the deformation is analysed. The experimental results agree well with the predictions of Reissner for thin shells and allow us to rescale our stiffness data such that a master curve of shell stiffness is obtained. The result of Reissner is strictly valid only for point like loading situations, while in our experiments a more extended plate like load is applied. Experimentally we find indeed little influence of the probe geometry on the shell spring constant. This result agrees well with finite element (FE) calculations that show that the Reissner result is a good approximation also for non point like loading situations, as long as small deformations are considered. We would like to acknowledge financial support from the German Science foundation (DFG) within the project “Adhäsion und Mechanik von Polyelektrolyt-Hohlkörpern” and the Max Planck Society. We are grateful for stimulating discussions with Prof. Helmuth Möhwald.